Look who just got LASIK! After an unqualified success for Ivan, it was Renata's turn under the excimer laser. Poor Renata had the vision of a bat with 1300 degrees of myopia and mild 75 astigmatism. The 1 day checkup was good so the most critical part of healing is over. We'll report back with her vision a week later! For a very short period, none of the family needs glasses. We say very short, because with genes from us the next person likely to need them is Ethan! Renata's vision has been tested 1 week post-LASIK and she now has perfect 6/6 vision! Amazing... especially for someone who had 1300 degrees of myopia. 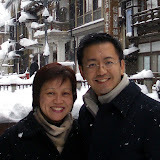 We highly recommend Dr. Julian Theng at www.eagleeyecentre.com.sg! Very cool that we're both free of glasses and contact lenses. WOW!! congrats,, sounds very tempting! !